The 990 is a marriage between two technologies, each element carefully arranged to play only to its strengths. It marks a true turning point in power amplifier design. Combining the effortless musicality of thermionic valves with the capable power delivery of solid state, it follows every musical twist and turn with ease and subtlety. High levels and demanding loudspeakers are effortless. The 990 power amplifier liberates music that will touch you, both supremely poised and beautifully coherent. The no compromise valve input stage is fully shunt regulated with its own separate transformer. This supplies all the voltage gain to the output stage, which is what valves do best. The output stage is arranged in a bridge configuration. The arrangement is effectively two amplifiers: one pushing and one pulling current through the speaker. This removes the large currents involved from the system's critical ground reference, keeping the amplifier supremely composed under heavy drive. The power supply for the power amplifier output stage is the hungriest in a system. The 990 takes the unusual step of using a choke input power supply. This enables the power reservoir to draw current from the mains supply in a much more linear fashion than a regular supply, resulting in a smooth and stable platform from which the output stage can deliver. At normal listening levels the first watt delivered is the most important. It is the most visited part of an amplifier's range. By using small and agile output FETs, performance at this critical level is optimised. When demand rises, higher power bipolar devices seamlessly contribute additional current to deliver impressive power when needed. Throughout the amplifier, great care has been taken with its physical construction. The heatsink, which is milled from a solid billet of aluminium, forms a spine through the centre of the case. This provides a substantial thermal mass, and allows the output devices to operate at a constant temperature, free from mechanical resonance. It also effectively screens the power supply magnetics from the sensitive audio circuitry. Solid copper binding posts are used to eliminate the audible mechanical resonance of more common brass. QuietBuss technology ensures the integral housekeeping microcontroller is completely inactive unless required. 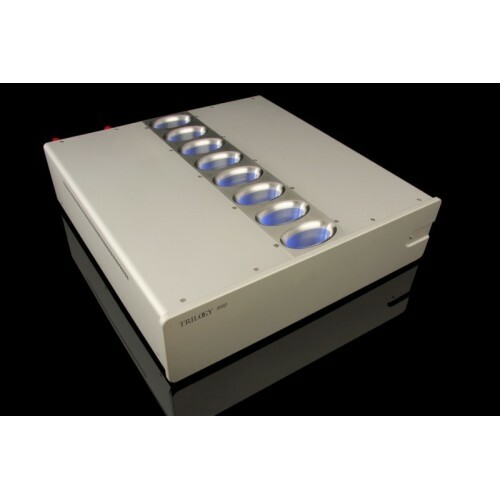 This keeps the audio circuits completely free from digital processing interference under normal operation, whilst protecting the amplifier against potential damage. Remote power switching and status monitoring is available through TASLink.